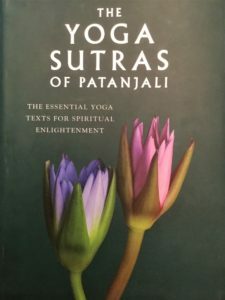 The Yoga Sutras of Patanjali—196 verses of yoga wisdom—begins by asking a fundamental question: What is yoga? Well, to be precise, the sutras begin with the sage calling yogis to take their seat. It’s time, he says, for the teachings of yoga. After we (the students) are presumably settled in place, Patanjali explains what we have gathered to learn. Yoga is restraining the mind stuff from taking various forms. Citta is the mind stuff. Vritti is the various forms we want to keep the mind stuff from taking. Notice we’re not trying to obliterate the mind, just manage the “stuff” that’s in it. You’ve likely heard the mind stuff referred to as “monkey mind.” All that chatter and worry and planning and fretting is what we want to reign in. Yoga, as you may know, means yoke. If we can yoke the various forms the mind takes, we can find peace. And peace, it turns out, is our true nature. The goal of yoga is to control the mind, so it doesn’t control us. That’s the short answer to the question: What is yoga? But we can’t just roll up our sleeves and control the mind by simple will and effort. First, we need to understand what we’re dealing with. To that end, Patanjali’s sutras go into detail about all the crazy things the mind does. Basically, the mind creates thoughts. Sometimes those thoughts are useful. More often, they keep us disconnected from our higher selves. I don’t know about you, but when my mind is racing with thoughts, I can quickly spiral into a troubled and dark state. Even positive thoughts can create a kind of mental clutter that keeps me stuck. I may think too much about what I want or how to get things done, when I’d be better off letting go. You know that experience of being so engrossed in something that you lose track of time? You’re one with whatever you’re doing, so it seems almost effortless. But what happens when you think too much about something you’re about to do? Suppose you’re about to speak in public, play an instrument, or hit a golf ball. And you think about it. And you freeze! Has that ever happened? When we move beyond our thoughts, everything flows. Yes, we probably needed to do some thinking at the appropriate time and in the appropriate way. Patanjali teaches us more about that as the sutras continue. For now, the teaching is simple. We need to still the mind, so we can do more of what we’re meant to do and be more of who we are. We don’t all define yoga the same way. For many people in the West, stilling the mind is more of a practical tool for dealing with stress and anxiety than a step along the path to enlightenment. 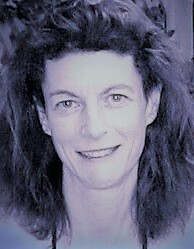 But in many cases, once we’ve dealt with stress and anxiety and recognized its connection to the mind, we open the path to a deeper understanding of our true nature. When you are you, you don’t need to think about it. The first step on the journey of yoga is to recognize we are not our minds. Yoga helps us see the tricks of the mind with more clarity. Yes, the mind will continue its tricks, even after years of practice. But the more we practice, the better we become at knowing who we are and making sure our minds don’t get in our way. Patanjali begins the teachings on the nature of mind by describing five “modifications.” You can think of modifications as types of thoughts that clutter our minds. They are right knowledge, indiscrimination (thinking we know when we don’t really know), verbal delusion, sleep, and memory. At first glance you may think these are not all bad. In some cases, that’s true, but they can still lure us into attachment to thought. I’ll describe the modifications in more detail in a future post. For now, the point is there’s a lot going on in our minds! Yoga teaches us to use the mind to our benefit and let go of what we don’t need. In fact, it teaches us to let go of it all at some point. In theory, at least, we can get beyond the mind to an expansive state of awareness. So, what is yoga? We may be able to answer that question after years of practice—practice that begins with learning about the nature of our minds. No rush, though. It’s a practice that continues to expand if you are willing to continue to practice.